Until pretty recently, I thought my marshmallow eating days were long gone. As a child, I thought they were awesome. Soft on the outside with a sweet, slightly chewy middle, marshmallows came big or small, pink or white (purely aesthetic with no nod to flavour as far as I can recall). My friends and I would buy penny twists with our pocket money, melt larger ones down to make the gooiest rice krispie treats or thread them on sticks before scorching over an open fire. As an adult, marshmallows fell off my radar. Pocket money was a thing of the past, people seem to expect something more sophisticated than a rice krispie cake if I’m bringing dessert and any outdoor adventures are fairly few and far between. Plus, if I’m honest, shop bought marshmallows don’t really cut the mustard any more: too bland, too uniform, too lacking in flavour compared to other sweet treats. Until, that is, I made my own. At the risk of sounding like a stuck record, I’m going to sing the praises of homemade treats over their shop bought counterparts (again). This is why I make my own bread and granola, pasta, ice cream, cakes . . . ok, I’m veering into pretentious food blogger territory here but I’m hoping you get what I mean. Good, honest ingredients and a little love can create results a world away from what you can buy in the shops: marshmallows being a perfect case in point. Made at home, what is essentially a square of sugar, egg white and air can be flavoured with all sorts of exotic ingredients, from fruit puree to alcohol, real vanilla or, as I’ve used here, spice. These marshmallows are festively close to Christmas territory with ginger, cinnamon and nutmeg plus two sticky spoonfuls of black treacle for colour and flavour. Marshmallows are easy to make if you start prepared. Have all the ingredients weighed out, read through the recipe before you get going, use leaf gelatin for a clean, flavourless set (rather than powdered) and invest in a sugar thermometer (inexpensive and not as scary a piece of equipment as I used to think, see below). We ate most of these marshmallows straight up before toasting and churning the rest through a pumpkin ice cream. They’re also awesome on top of hot chocolate, squidged between cookies with chocolate for an autumnal s’more or melted down to make the most incredible krispie treats. For some reason I used to think sugar thermometers were far too fancy for my kitchen and was slightly scared of the techniques they involved. Please don’t be. Since buying one I’ve realised it’s just another piece of equipment and very easy to use. And for making perfect fudge, sweets, marshmallows etc, it’s pretty much essential. Lightly grease a 20cm square tin with ground nut (or another vegetable) oil. Line with parchment paper and lightly grease again. In a small bowl, sift together the icing sugar and cornflour. Use a couple of teaspoons of this mixture to dust the inside of your greased tin. Place the gelatine leaves in a bowl of cold water and set aside to soak while you prepare the rest of the ingredients. Place the egg whites in the bowl of a stand mixer fitted with the whisk attachment. Add 1 tbsp of the caster sugar and salt, but don’t whisk yet. In a separate, small bowl, mix together the spices. Combine the remaining caster sugar, light brown sugar, treacle and golde syrup in a medium saucepan with 150ml water. Bring to the boil then cook steadily until the syrup reaches 115 degrees C on a sugar thermometer (see headnote). Remove the pan from the heat. Working quickly, whisk the egg whites until stiff peaks form. Drain the softened gelatine and stir into the warm syrup mixture until combined, then carefully pour the syrup into the whipped egg whites, continuing to whisk on low speed. Don’t worry when the mixture foams up, this is supposed to happen. Increase the speed to medium and whisk for a further 3 – 4 minutes until thick and glossy. Finally whisk in the spices then scrape the mixture into your prepared tin. Shake gently to level of the marshmallow then allow to cool completely before covering with cling film and leaving to set until firm, about 4 hours. Tip the remaining icing sugar/cornflour mixture onto the work surface. 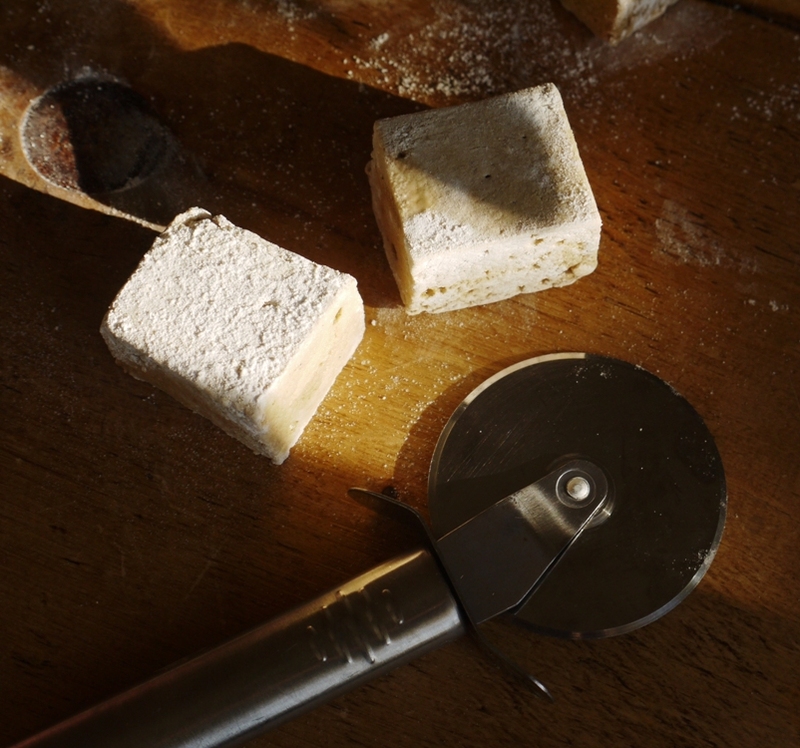 Turn your marshmallow out of the tin onto the work surface, peel off the lining paper and use a sharp, lightly oiled knife to cut into squares. Dust each square with icing sugar and serve. Because these marshmallows contain egg whites they are best stored in an airtight container and eaten within a week. Oh my goodness. These look delicious. Definitely adding to my life of festive recipes. GAH. Gingerbread marshmallows! These are like a cloud of Christmas flavour! OMG, they are perfectly squared ! And look scrrrrumptious ! Greatbefore minds think alike was planning to make marshmallows this week! For the ones you didn’t churn how long before they go stale? (Providing you dont eat them all at once!) Would up to a week be advisable for gift giving? Wow, I would love to try those! Do you know if the veggie friendly gelantine leaves work well with your recipe? 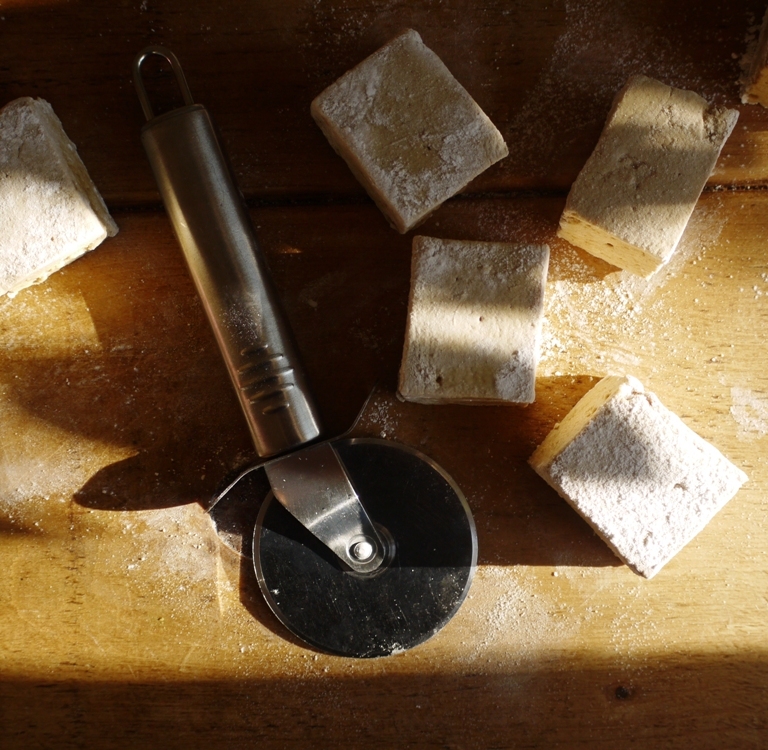 Cardamom marshmallows may have to be next on my list! And the trick to sharp edges is a lightly oiled knife, it just slips through so cleanly. I adore marshmallows. Especially toasted. 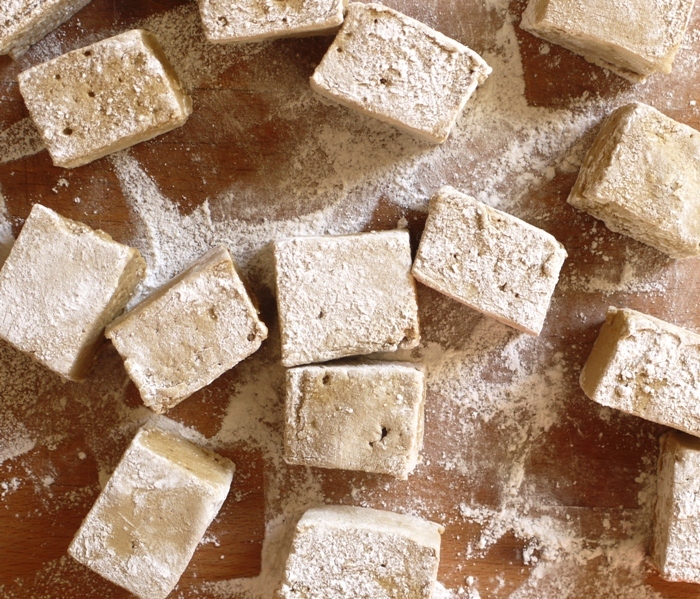 But have never tried making my own… And I have never even thought of gingerbread marshmallows – what a wonderful idea. Of course – that’s perfect! Thank you so much. Will let you knwo as and when it goes live. Happy cooking! What a cool idea! Autumnal marshmallows :D. I’ve been meaning to make marshmallows for ages – then again I’ve been meaning to make a lot of things for ages. Yours look great! How funny, my daughter and I saw a recipe for marshmallows the other day and said we must make some (having never made them before) and now I see yours which look so professional and with their lovely flavour combination – perfect for Christmas, we’ll try them. Totally agree with you about home made, am always banging that particular drum myself….! These sound delicious! I’ve made fruity marshmallows before and you’re definitely right that they’re so much better than the ones you can buy in the shops. These do sound nice and festive, think I might have to add them to the ever-growing “things to make for Christmas” list! I made homemade marshmallows a while ago for the first time (they’re not easily found here) and I agree that it’s the only way! The flavors here are so comforting, so perfect for cold weather. Great recipe Kate! Oh wow I’m so impressed you made your own marshmallows! They look so professional and the flavours sound divine! Why on earth had I never been compelled to make my own marshmallow before?! These look beautiful! So simple, so delicious, so much better than shop bought. Go make some now! I’ve been wanting to make homemade marshmallows forever! This ginger version would be such a great holiday treat. Definitely, I’m planning to make a big batch and pack them up as Christmas presents! I have always wanted to make my own, and I have been obsessed with gingerbread. No more excuses. Love these. I’ve always wanted to make marshmallows. These sound delicious. I recently lost my sugar thermometer and am definitely missing it! So funny, I was going to make this exact recipe (I think, or at least a very similar Annie Rigg one that was in one of the BBC food mags this month) so good to know that I made a wise recipe choice! 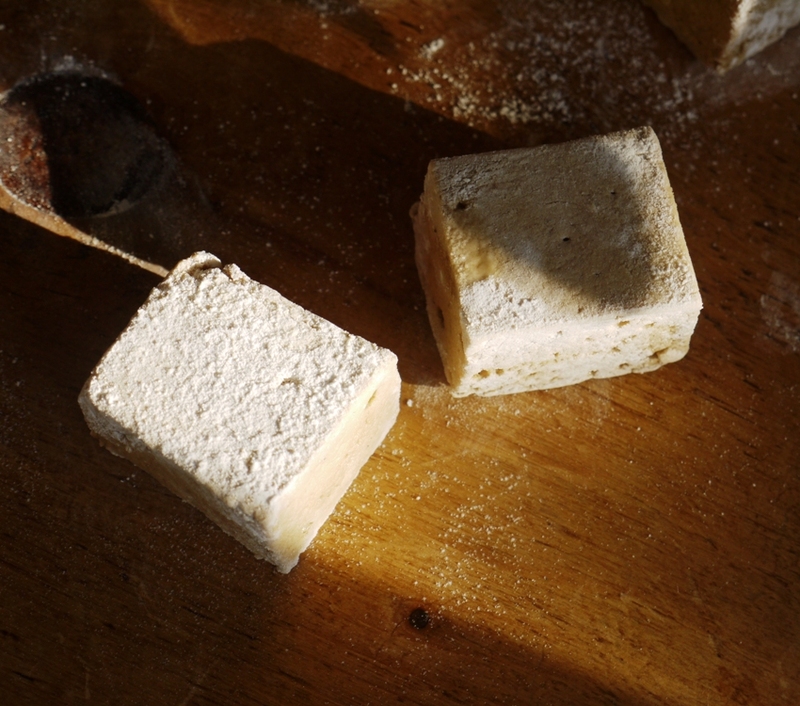 I had some spectacular basil marshmallows a few weeks ago that I’m anxious to recreate too; I love homemade marshmallows! I keep telling myself I will make marshmallows at some point but never get down to doing it. These look really soft and pillowy, great texture. 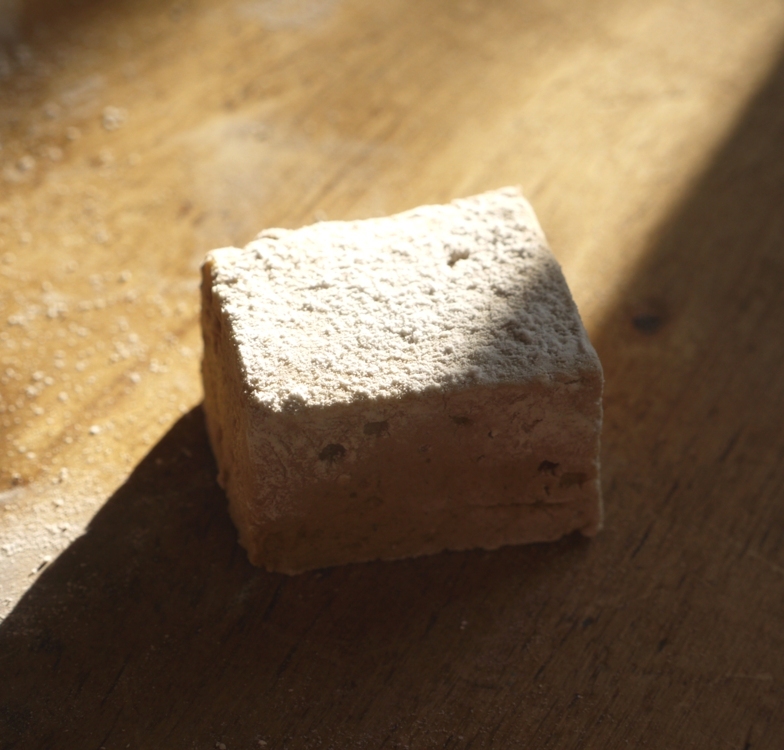 The texture is wonderful, so much lighter than a shop bought marshmallow with a good amount of chew. I couldn’t agree more about home made stuff, it tastes just so much better. Love these gingerbread marshmallows I will definitely be giving these a try in the run up to Christmas! It always surprises me how simple it is to make marshmallows! I am a little addicted to that moment when you pour the hot sugar into whipped egg whites and it goes thick and glossy and more than doubles in size! I’ve found that using tupperware tubs are the best thing to set marshmallows in, they turn out really easily from them. I love your flavour choice, I made pumpkin pie marshmallows a couple of weeks ago and was looking for a more wintery rather than autumnal flavour combo for my next batch. I made my own marshmallows once and it really was amazing how much more delicious they were than any of the storebought varieties! Plus you can flavor them however you want! Love this gingerbread version. All those warming spices…mmmm. Wow that looks amazing, great idea, definitely going to try this. Why use leaf gelatin instead of powdered? I only have powdered and am wondering if it would be ok? Hi Lilli, You can use powdered gelatin but the results won’t be as clean and pure. I find leaf gelatine gives a perfect set without imparting any flavour which is why it works so well in these marshmallows. I’ll admit to still not loving the leanness of marshmallows, but I absolutely hated them (unless melted and gooey) before making them at home. A fluffy homemade marshmallow is miles away from a store-bought one. 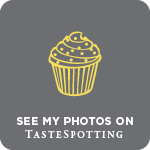 Count me in as another pretentious food blogger :). OMG, looks amazing! I so want to try these. These sound fantastic! I’m not a marshmallow fan either, but I’m sure I could come at some homemade marshmallows. And you’re right. Everything does taste better homemade! What a wonderful flavor for marshmallows, that sounds perfect for the holidays. I’d imagine that it would be terrific in a spicy hot chocolate. I have never been a marshmallow fan but you make them almost appealing to me when you talk about homemade, natural ingredients and all those flavor possibilities… You convinced me that they could be a great present with the holidays coming up or a special, occasional treat for the kids.